Want to be notified of new releases in ACCLAB/DABEST-Matlab? DABEST is a data analysis tool that is intended to make estimation statistics more accessible to scientific communities. Estimation statistics is a superior alternative to null hypothesis significance testing (NHST), in which effect size and confidence intervals are used to interpret results as opposed to dichotomous significance testing. This code allows the user to visualize the data as scatterplots; calculates the effect size and confidence intervals of the difference between multiple groups; and plots the results on the same figure. This figure design allows for a visual inspection of the observed values distribution, and displays the differences between multiple groups of data. DABEST-Matlab can be installed via MATLAB Central (https://www.mathworks.com/matlabcentral/fileexchange/65260-dabest-matlab) or GitHub (how to clone a repo: https://help.github.com/articles/cloning-a-repository/). Data should be in the csv file format and contain two columns with the headers: Identifiers and Values. 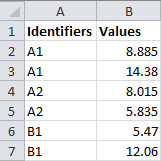 Identifiers are the labels of each data point, and Values are the data points (see the example below). Note: All the sample data used in this tutorial are taken from S. Champely's anscombe2 dataset, and can be found in DABEST-Matlab/SampleData/. If the data have two different groups, dabest('TwoGroups_sample.csv') generates a two groups plot. Running dabest('TwoGroups_sample.csv','Paired') generates a paired plot with the two groups data. If the number of groups is an even number, a multiple groups plot will be automatically generated by dabest('MultipleGroups_sample.csv') command. If there are more than two groups in the data, dabest('MultipleGroups_sample.csv') generates a shared control plot. To combine two groups of data and compare to a third group, run dabest('MultipleGroups_sample.csv','mergeGroups'). For the data that contain more than three groups -and a number that is divisible by 3, dabest('MultipleGroups_sample.csv','mergeGroups') generates a multiple merged groups plot. If the data contain more than three groups, dabest('MultipleGroups_sample.csv','mergeGroups') automatically generates a second plot in which all the groups are compared to the merged shared control.